BEIRUT -- Ten years ago, as violence and insecurity engulfed Venezuela, Sarah Hawi finished high school in the capital, Caracas, and left for Lebanon. For Venezuelan-born and -raised Hawi, the move was a reversal of the migration of her grandfather and later, her parents, who are Lebanese. She wasn't quite prepared to make the transition. She visited Lebanon the first time three years prior to immigrating. Once she got there, it was an adjustment. “I was terribly confused. It was a huge change in weather, friends, family, absolutely everything. I wanted to leave,” she recalled of her early days living in Lebanon. Now, Hawi, a graphic designer and event planner, has learned to speak Arabic and has married a Lebanese man. She has a 6-year-old son, who was born in Lebanon. She speaks to him in Spanish and tells him so much about Venezuela that he’s eager to visit the South American country. “My heart is Venezuelan, but my blood is Lebanese. And that is something I cannot deny,” she said at a Starbucks on a late afternoon. Although there is a long history of migration from Lebanon to Venezuela, that flow has been increasingly reversing as Venezuelans with Lebanese roots leave the South American nation to flee its economic and political unrest. There are more than 12,000 Venezuelans registered at the embassy in Beirut. The majority have Lebanese ancestry, possess dual citizenship, and travel back and forth between the two countries, according to a Venezuelan embassy official. For years, Venezuelans have been grappling with increased violence; the country has had one of the highest murder rates in the world. That has contributed to Venezuelans uprooting to live elsewhere. Today the country of 31 million is facing soaring inflation and extreme shortages in everything from food to medicine. Since April, there has been a wave of near daily anti-government protests where dozens have been killed. Lebanon, a small Middle-Eastern country of 4 million, has not been immune to turmoil in the past, but has become an attractive alternative for many Venezuelans. One year ago, Jeber Barreto and his wife moved to Beirut from Venezuela. His wife's father was born in the northern town of Bcharre and had moved to Venezuela when he was 16. Barreto and his wife considered moving to Miami, which they visit often and has the largest concentration of Venezuelans outside the country, but they opted for Lebanon. By then, the couple was expecting their first child and they decided Lebanon would offer their son the best education. Enrolled in one of Lebanon's private schools, which are common throughout the country, their son will learn French, English, and Arabic. He will learn Spanish at home. “Lebanese people have been very welcoming, affectionate, and have made me feel at home,” said Barreto, who is learning Arabic, but continues to own businesses in Venezuela. He also remains politically active from abroad. He is the representative of Venezuela's opposition Popular Will party whose leader, Leopoldo Lopez, was recently released from prison and transferred to house arrest. Barreto organized voting centers throughout Lebanon for Sunday's referendum on President Nicolás Maduro’s plans to rewrite the constitution. More than 7 million Venezuelans in the country and around the globe voted to reject the rewrite, opposition leaders said Monday. The steady stream of Venezuelans are slowly finding their way in Lebanon, while adding touches of their home country. Some small catering businesses have opened where Venezuelan food is prepared in homes and delivered. Raghida Naim, who came from Venezuela 10 years ago, opened Doña Arepa a few years back. She prepares arepas, empanadas, tequeños (fried breaded cheese) and other traditional Venezuelan foods. Sometimes, demand is so high when there is an event that she rents a restaurant to have enough space to cook. Despite the success, “I miss my homeland with all my heart, as well as my family and friends,” said Naim. 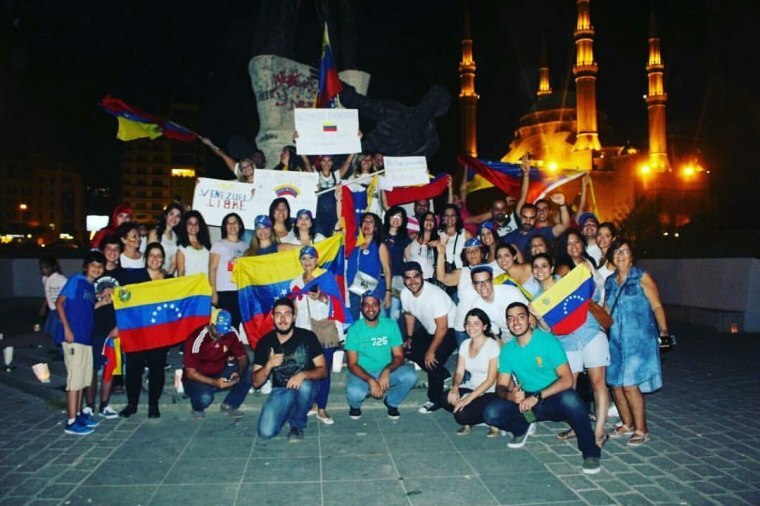 American University of Beirut has so many Venezuelan students enrolled there is now a Latino student club called Sangre Latina, or Latin Blood with around 100 members – most of them Venezuelan. The club offers Spanish classes and members teach their Lebanese peers about Venezuelan traditions and foods. Five years ago, as Venezuelans were increasing in numbers, Hawi founded an organization called Venevent. She holds gatherings for the Venezuelan community to get to know each other and feel a taste of home. They recently held a 5K marathon for peace to spread awareness of the conditions back home. They have also held around 10 protests in Beirut during the past five years over the crisis plaguing the nation they left behind. In one protest that went viral on social media, Hawi and Rima Koumaira, also Venezuelan-Lebanese, interrupted a speech by a top Venezuelan official in Beirut. Emigration from Lebanon to Venezuela and the rest of Latin America began in the mid-19th century, when Lebanon was part of the Ottoman Empire. It has continued through modern times, such as in 2006, when Israel and Hezbollah engaged in a 33-day war. The early migrants from the 19th century are referred to as “Syro-Lebanese,” according to Elizabeth Saleh, program director of Syrian Displacement and Forced Migration at the Asfari Institute in American University of Beirut. The name has to do with the geography at the time. Lebanon gets its name from Mount Lebanon or Jabal Lubnan, the range of mountains that extends through the country. “People who migrated before the establishment of the modern Lebanese state  and who, at the time, lived outside of the parameters of Mount Lebanon, but within today's Lebanese borders, were considered to belong to greater Syria,” according to Saleh. “It was mostly young men who were sent abroad in search of opportunity. They would then send remittances back home and return to find a local bride,” said Saleh, an anthropologist who has studied migration patterns across the Middle East. Saleh said Lebanese emigration can be broken down into five waves. During the first wave, which occurred in the late 19th and early 20th centuries, migration was largely due to political instability and conflict due to lack of economic security. In 1840 and 1860 there were civil wars between Maronite Christians and the Druze in Mount Lebanon. Additionally, in the late 1800s to early 1900s, there was a crisis in sericulture, the backbone of the Lebanese economy at the time. Silk was traditionally harvested from silkworms that grew on mulberry trees. But the industrial revolution brought agricultural equipment, trains and ships. Cheaper silk produced in China dropped global demand for Lebanese silk. At this time, most of the migrants to Venezuela and other parts of Latin America were Christian. The second wave of migration occurred as a result of the Great Famine of Mount Lebanon between 1915 and 1918. The area faced a swarm of locusts that devoured crops. Around one third of the population was wiped out as a result. Consequently, more people left. They often joined relatives that had migrated earlier, according to Saleh. The third wave took place post World War II, between 1945 and 1960. At this point, the émigrés were more diverse in terms of religion and socio-economic background. They included Sunni, Druze, Shiites and Christians, Saleh said. The fourth and fifth waves were due to conflict. Many left during The Lebanese Civil War that lasted from 1975 to 1990. There was also migration during the 2006 Lebanon War between Israel and Hezbollah. Many of those who have been leaving since the 1970s are mostly educated men and women seeking better jobs overseas and causing a brain drain in the country. It’s impossible to determine exactly how large the Lebanese diaspora is in Latin America, but it’s certainly more than triple the population size of Lebanon today. The first Lebanese migrant recorded in Venezuela arrived in 1861 and since then the number has grown to over 800,000, including registered citizens and descendants of Lebanese who are not registered, according to data from the Lebanese Embassy in Caracas. The number can easily reach 1 million because there are families who settled in rural areas of the country and have not had contact with the embassy. In 2013, the Unión Cultural Líbano Venezolana, the local chapter of the World Lebanese Cultural Union, inaugurated the Gibran Khalil Gibran Space in the municipality of Chacao. The $1 million center was named after the great Lebanese-American writer, poet and artist. The Lebanese community created the meditation space for the 150th anniversary of the presence of Lebanese in Venezuela, said Michel Assef, who was president of the organization when the plaza was built. Rima Koumaira, who protested with Hawi, has been living in Lebanon since 1999, when the late Venezuelan president Hugo Chavez took power. Her father had left the Chouf district in Lebanon for Venezuela when he was 18 years old. It was the 1940s during the third wave of post World War II migration. Her mother also was from Lebanon. Koumaira grew up in Venezuela and visited Lebanon for the first time after the civil war ended in 1990. She met and married her husband during a visit to Lebanon and the couple returned to Venezuela to live. But by the late 1990s widespread violence and kidnappings were creeping in. “My husband said, I don’t want this for our children,” Koumaira said. After 18 years in Lebanon, she and her husband only speak to their children, ages 11 and 18, in Spanish. “If you heard my daughter speak, you would think she grew up in Venezuela,” she said. “My children love Venezuela,” she said. Yet, she said she does not feel at home and still feels like a foreigner in Lebanon. “I am very grateful for Lebanon, but I don’t feel it’s my homeland. If I die, I want to be buried in Venezuela, my beautiful Venezuela that I’m always thinking about,” she said crying.